Neighborhood Watch has long been called the extra “eyes and ears” of law enforcement, but in cities across America, the program has evolved into something more—a complex relationship that unites citizens, government leaders, and community policing officers as equal partners in crime prevention and community safety. Additionally, many Neighborhood Watch organizations are extending their reach by addressing issues such as community revitalization and disaster preparedness. It is not uncommon to see Neighborhood Watch members organizing community cleanup days, for example, or taking part in first aid training and other activities aimed at improving the health and welfare of local residents. As Neighborhood Watch members increasingly shoulder more responsibilities, recognition of their contribution and expertise becomes critical. By cultivating a healthy, productive partnership with their crime prevention volunteers, law enforcement agencies can successfully fight crime while ensuring good relations with the communities they serve. One such organization that has consciously worked to strengthen the bond with its Neighborhood Watch program is the Akron Police Department. The agency recently organized its first block captain recognition ceremony and is exploring ways in which to encourage volunteer participation in its future planning efforts. Lt. Chris Brown, Block Watch Captain George Mosby, Mayor Pusquellic, and Police Chief Gilbride. The birthplace of such corporate giants as Goodyear and Firestone, Akron is a city built on industry and achievement. The name Akron is derived from a Greek word meaning “summit” (from the same root as “Acropolis”). It should, therefore, come as no surprise that this northern Ohio metropolis is home to a network of dedicated, high-achieving volunteers. Managed by the Akron Police Department, the Akron Block Watch, as the city’s Neighborhood Watch program is called, dates back more than 23 years. Today, 13 sworn police officers from the department’s Community Oriented Policing Service (COPS) serve as liaisons to the city’s 140-plus city Block Watch groups, which comprise approximately 1,000 members. Home to just over 200,000 residents, Akron has managed to steer clear of the violent crime patterns that plague many of its larger counterparts. Nonetheless, drug- and gang-related crime, burglary and petty theft, juvenile curfew violations, and quality-of-life issues keep law enforcement officers on constant vigil. Drug enforcement, in particular, has proved challenging due to the methamphetamine epidemic that has threatened to ravage the Midwest. In 2008 alone, law enforcement officials raided and dismantled 68 meth labs operating within Akron and greater Summit County. Vigilance is paying off, as demonstrated by declining crime rates within Akron’s active Block Watch neighborhoods. In one instance, Lt. Brown noted, a Block Watch group received information that a serial burglar was on the prowl. Members began gathering details about the suspect and compiled a description for police, who then were able to apprehend the perpetrator. 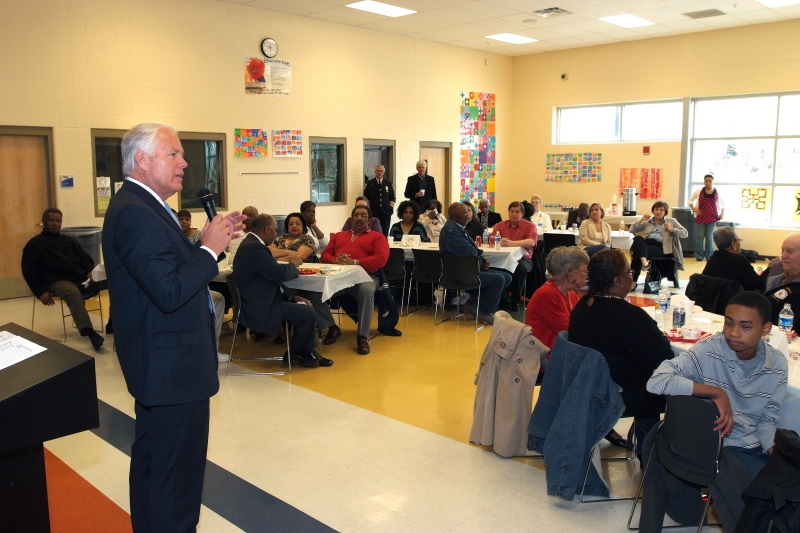 Akron Mayor Don Pusquellic addresses the city’s Block Watch captains. Today, crime prevention activities comprise only a fraction of the duties the average Neighborhood Watch block captain may be called on to perform. The Akron Neighborhood Watch Program Manual lists primary responsibilities as leadership and coordination, service as a liaison between the police department and residents, new member recruitment, map compilation and list management, distribution of crime news and trends, and coordination with fellow Block Watch captains. In reality, for many members, Block Watch activities expand far beyond any bulletized list. Fundraising drives, neighborhood cleanups, teen mentoring programs, National Night Out events, and other projects make for a very full plate for Akron’s cadre of dedicated volunteers, whose efforts have not gone unnoticed by law enforcement. “I’ve been in this role since 2001 and everything I’ve asked of our volunteer leaders they’ve done,” Lt. Brown acknowledged. 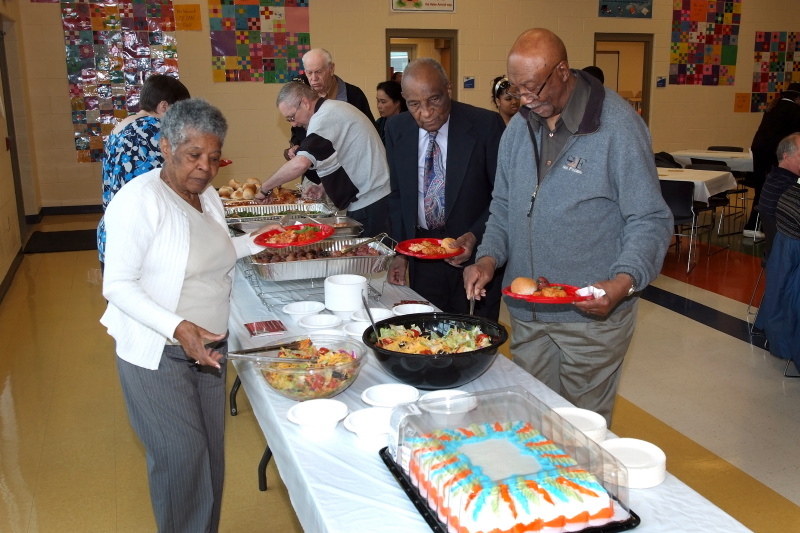 Akron Block Watch captains were treated to a buffet during the recent awards ceremony. Akron is but one of thousands of American communities with a strong volunteer tradition. According to a 2008 Bureau of Labor Statistics report, nearly 61 million Americans—one quarter of the population—volunteer nationwide. Although volunteerism rates are highest among people in their mid-30s and 40s, statistics indicate that Americans of all ages are ready, willing, and able to lend a helping hand if properly motivated. Two major challenges many nonprofit organizations face are retaining an active volunteer pool and reducing turnover. The Corporation for National and Community Service (CNCS), an independent agency of the U.S. federal government, offers a series of online resource publications (www.nationalserviceresources.org/topics/service-activities) designed to help nonprofits effectively manage their volunteer programs. The Akron Police Department has also incorporated innovative role-play during Block Watch events in order to dispel misconceptions and let participants safely experience crime-fighting from the law enforcement perspective “At one point, we had several unsolved homicides, and I was sure that the community wondered why the police hadn’t solved them,” Lt. Brown explained. He and his staff staged a start-to-finish mock homicide and crime scene response to the event prior to a regularly scheduled Block Watch meeting. Attendees, who had been unaware that the event would take place, were interviewed “on the scene.” Afterward, they proceeded to the classroom, where officers replayed the shooting step-by-step as “witnesses” put their crime reporting training to the test, comparing the descriptions they had given with what actually occurred. As the scenario above illustrates, volunteers want and need to feel involved in problem-solving, decision-making, and objective-setting. Neighborhood Watch members who have a stake in current and future planning and assessment feel a stronger sense of involvement and appreciation than those who sit on the sidelines. References to specific successes and accomplishments of previous tasks, projects, and assignments boost morale and help sworn officers and volunteers chart a course for future initiatives. The recent awards ceremony afforded the Akron Community Oriented Policing Service the opportunity to provide an overview of long-term departmental goals and solicit feedback and ideas. “Our volunteers help shape how we police, and we want to give our Block Watch leaders a better platform for dialoguing questions,” Lt. Brown said. Plans are now underway to form a special committee composed of representatives from the Akron Police Department and mayor’s office and the city’s Block Watch captains. The committee initially will focus on selected hot-button issues, including quality-of-life complaints (e.g., loud music, drug houses) and recidivism. “We want to correct the repeat offense problem by focusing on individuals who are continually in our system and a strain on public resources. We will ask them for a change of behavior and direct our resources into making sure these people correct themselves,” explained Lt. Brown. They can see their involvement makes a difference. They receive private and public recognition. They feel capable of handling tasks they are offered. There is a sense of belonging. Their personal needs are being met. They feel involved in problem-solving, decision-making, and objective-setting. They recognize that something significant is happening because of the group. As for reasons why interest wanes, the manual list discrepancies between the volunteer’s expectations and reality; no feeling of making a difference; monotony; lack of praise, reward, or prestige; no chance for personal growth; no opportunity to use creative skills; and tension among group members. The following publications provide information on how to leverage volunteer support and ensure volunteers have the tools they need to grow and contribute to organizational success.